Last time, I thought the title had a double meaning with 'broken staff'. That episode saw the pursuit of Prospero's 'broken staff' and the uniting of the 'broken staff' of The Library. One can argue that I was reading too much into it. This time there is no ambiguity. And What Lies Beneath the Stones has a clear dual meaning. We see what 'lies beneath the stones' when we go underground to investigate the strange goings-on involving shape-shifters. However, we also see what 'lies beneath the Stones', as regards the Stone Family of which one of the Librarians, Jacob Stone, is part of. Come to think of it, there is actually a THIRD meaning behind And What Lies Beneath the Stones, with regards to the 'lies' that are beneath both Stones, pere et fils. See Jake, I too speak more than one language. The fact that we can have an episode that is a.) intricately clever, b.) still fun and logical in its way, c.) character-driven, and d.) a chance to showcase a fan favorite makes this I think the best Librarians episode so far. The Library's Clippings Book sends the Librarians to Oklahoma (where the wind comes sweeping down the plain, John Larroquette's Jenkins helpfully offers) to investigate an unintended discovery made by a pipeline company. This investigation hits too close to home in more ways than one for one Librarian: Oklahoma roughneck/art expert Jacob "Jake" Stone (Christian Kane), a situation made worse by the fact that Stone's father Isaac (Jeff Fahey) is that pipeline company's owner. Jake and Isaac have never been close. Isaac thinks his son is a waste, unaware that he is really a genius. More than once he ridicules his son. "Unless you're degreed for digging holes and chasing women you ain't an expert in nothing," he tells Jake. Jake continues to mask his high intellect to his disapproving father, putting Ezekiel Jones (John Kim) as his front man. It is no surprise that Jones has no idea what any of the history behind their discoveries are. While Jones and the other Librarian, Cassandra (Lindy Booth), see the Stone dynamics as some sort of oddball reality show, they are there to do a mission. Isaac has dug in a Choctaw burial ground and inadvertently released a shape-shifter who feeds off of lies and the chaos wrought by them. The Stones are a feast of lies (starting with the fact that Isaac did not have the permits he needed to dig and Jake's denials about his own brilliance being a banquet). Back at the Annex, Jenkins and Colonel Baird (Rebecca Romjin) are attempting to catalog all the rooms and artifacts of the Library but offer advice on how to deal with the shape-shifter, who is growing stronger. Jake, realizing that he has been too focused on his own personal problems to see what was going on, rallies and finally tells his dad the truth about himself. This leads to an epic battle between Jake and the shape-shifter, who must be imprisoned back in his stone prison before he is allowed to do such things as cause war. It's no secret that Rick's Café Texan has become a hangout for the Kaniacs (for the uninitiated, the name fans of Christian Kane have given themselves). I love the Kaniacs and they always get a round on the house here, and it looks like both Kane and Stone's popularity has translated into a Stone-centered episode. And What Lies Beneath the Stones is a remarkably multilayered episode while still keeping the breezy fun and fantasy The Librarians specializes in. I cannot help but wonder if it is coincidence that Jacob's father is named Isaac. If one knows the Bible, we recall that in the Old Testament, the patriarch Isaac is the father of Jacob. In that part of the saga of 'the Sons of Adam', Isaac accidentally blesses Jacob rather than his older brother Esau thanks to a deception concocted by their mother Rebecca. Here in this story, Isaac will not 'bless' his son Jacob, seeing him as a failure who could only get his head around a football playbook (which is an odd criticism given Isaac's contempt for intellectuals). If one can speculate, something our Jacob would have loved would have been Isaac's blessing, but he sees that he will not get it, and especially won't get it for being passionate about art and architecture (no man apparently gets as much joy out of writing an academic criticism on Colonial architecture that blows holes in the influence of Georgian design in pre-Revolutionary American buildings while upholding French Huguenot influence than our good old country boy). When Isaac tells Jones in the caves he wishes his son would have been like him and makes that 'football playbook' crack, through the earpiece Jones has Jake snaps that he also got his head wrapped around a Greek text he taught himself to read at age 9. The struggle between our Isaac and Jacob is best summarized in the company's name. One reason Jake leaves his old life is because his father will not change the company name from Stone Family Rigging and Pipeline to Stone and Son despite his father's promises to do so. The undercurrent of resentment and genuine hurt in Jake is there, and I think this is Christian Kane's finest hour on The Librarians. He keeps an extraordinary balance between the emotional and the comical. Kane even manages to make his revelation of the truth about his high intellect funny and touching at the same time. When Kane as Stone yells at his father (or at least something masquerading as his father), "I'm a genius, Pop!" then goes on about how he speaks 9 languages and can read a dozen more, it's not a sign of arrogance but a straight-up confessional. It's more a statement of fact than shameless bragging, and Kane should be congratulated in keeping all the balls in the air and not dropping one. Of course, the character-driven story doesn't skimp out on the humor and fantasy elements in And What Lies Beneath the Stones. It also doesn't short-change the other actors. In fact, we get to see them with a little variety themselves. Kim keeps the humor and almost child-like essence of Jones. When Jake reproaches him for having interest only in the Library's movie theater, Jones replies "Movies are just books with better pictures, and less of those words and stuff", explaining all there is about Jones' worldview. However, when the shape-shifter briefly takes on Jones' appearance, there is a darkness and menace in those few moments that shows Kim can play dark and menacing if need be. We already have seen Booth can play against the persona of Cassandra's generally sweet nature, but it's good to see her continue to show us her range. Jeff Fahey's guest turn as the hard Mr. Stone is equally good, the gruffness and dismissiveness of Isaac making it clear why Jacob both hid his extraordinary gifts and left his old life for a group that accepts and appreciates him for his true self: working-class guy who likes beer, football, and a good Frank Lloyd Wright/Henry Trost building. Who knows if Fahey will make a return appearance, but I'd love for Jacob and Isaac to have another reunion. Fahey did a wonderful job, especially when we think he finally breaks down to admit he loves his son ('think' is the operative word). We simply cannot leave Larroquette gets in on the act. His Jenkins has always been a bit stuffy and formal, always referring to everyone by their surnames with the exception of Flynn Carsen, whom he addresses as 'Sir' (despite Jenkins being much older). When he runs into Stone at the end of the episode, he offers rather sensible advise regarding our inability to please all our parents. "We cannot help where we come from, but we can choose how it manifests itself". When Stone replies, "You're saying what we're made up of is different than we're of", Jenkins has an uncharacteristically curious reply. "I'm saying family ain't easy," which is closer to Stone's speaking style than Jenkins more formal pronouncements. To me, it suggests a breakdown to Jenkins' rather formal manner, or at least a tacit acknowledgment to Stone's more working-class roots. Larroquette continues to be such a wonderful part of The Librarians, and What Lies Beneath the Stones shows off how he is in on the joke. Jenkins is usually our source of information to anything supernatural, and he reveals information through his stuffy meetings. When he discusses the shape-shifters (whom Jones is convinced are poltergeists, at one point saying, "Three words: Pol-Ter-Geist"), without missing a beat Jenkins tells him that most poltergeists have moved to Finland, being fond of curling. The fact that Larroquette can deliver all the funny lines without making it obvious he's being funny, as if Jenkins truly isn't aware how odd a lot of this sounds, is a testament as to why he is a multi-Emmy winner in BOTH comedy AND drama. Simply put, John Larroquette is an immensely talented actor, and The Librarians is a wonderful showcase for his talents. I think the whole cast is simply wonderful, each playing their distinct parts well while still being allowed to show greater range when needed. And What Lies Beneath the Stones is I think the best Librarians episode yet. We got the usual comedy (the way Cassandra and Jones find amusement in Jake's situation, seeing it as a reality show with such names as Stoned Again, Stone Age, Family Stone) and fantasy (the battle with the shape-shifter as it unleashes chaos), a shout-out to another fanbase (Firefly's Browncoats, when Cassandra notes she can tells something is off about the caves because she can measure the 6'2" Nathan Fillion to the Serenity and see how they all fit together), and character development (the dynamics between Jacob and Isaac, or as I call them, Lie and the Family Stone...couldn't resist). And What Lies Beneath the Stones is again, in my view, the best The Librarians episode yet. It's almost sad that I sound like an unabashed fanboy and less like an analytical critic (paging Kyle Anderson), but I am a fan. I'm a fan of the show, of the characters, of how the production has embraced the premise without talking down to its audience, of its unapologetic family-friendly nature, and of its willingness to expand beyond a 'monster of the week' to give us insight into our own curious group. I suspect we'll get more character-driven episodes to see how each ticks and came to be. Dare we see And the Prophesies of Cassandra or And the Thief of Bagdad? 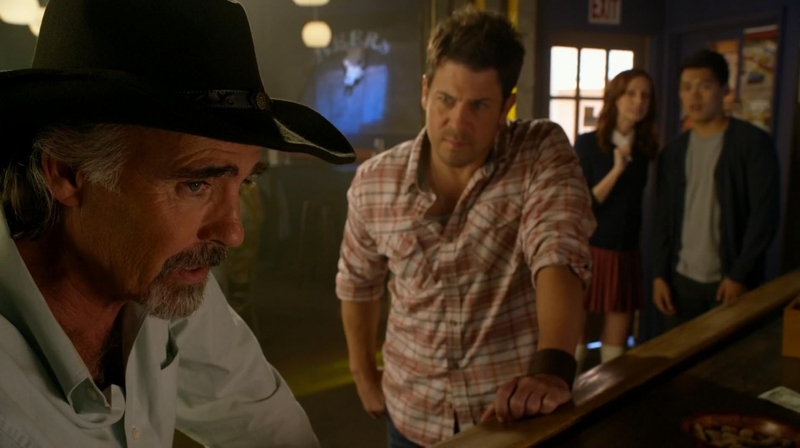 This is my personal favorite one And What Lies Beneath The Stone episode of The Librarians.. Really loved Jeff Fahey as Jake Stone aka Christian Kane's POP.. great choice of guest stars.. Hope to see more of him when we get a Season 3 of the show! Thanks for sharing! Very insightful review. I agree with all of it. This show may not win any awards but it captures the heart of its audience and that is far better. The entire cast is multi talented and a joy to watch. I will gladly go on the journey this show takes you on for eons.